I am thrilled to be included in the current issue of STIL, Goetheanismus in Kunst und Wissenschaft. The following show will be a great excuse to take a ride to beautiful Wells. I will be represented with 2 sculptures. I am looking forward to seeing you there. 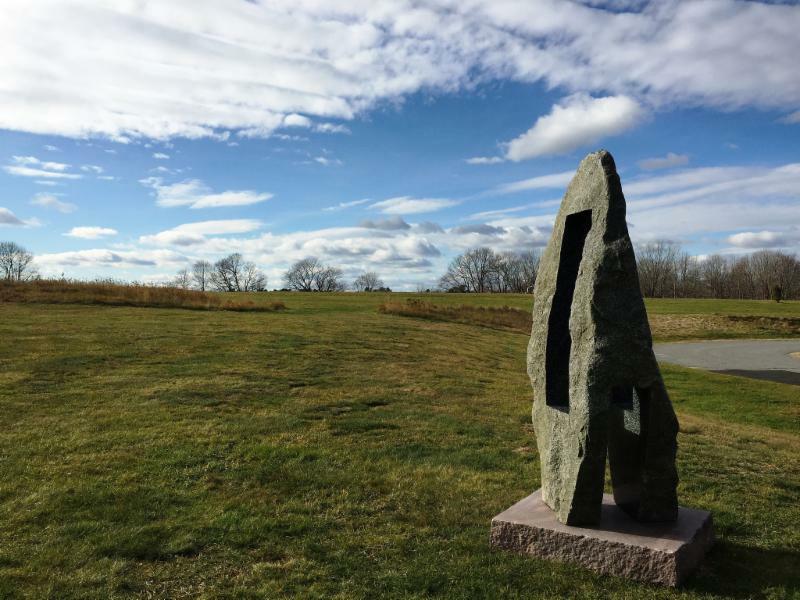 Coastal rolling fields and woodland trails offer dramatic settings for 65 outdoor sculptures in granite, steel, marble and bronze by New England artists. Dave Allen, Anne Alexander, Lise Becu, John Bowdren, Ray Carbone, Kate Cheney Chappell, Miles Chapin, Dan Dowd, Peter Dransfield, Paul Heroux, Mark Herrington, Andreas von Huene, Eugene Koch, Wendy Klemperer, Cabot Lyford, Jean Noon, Jac Ouellette, Roy Patterson, Meg Brown Payson, Mark Pettegrow, Patrick Plourde, Stephen Porter, Antje Roitzsch, Constance Rush, Cat Schwenk, George Sherwood, Gary Haven Smith, Jordan Smith, Cynthia Stroud, Sharon Townshend, Digby Veevers-Carter, Dan West, Melita Westerlund, John Wilkinson, Joyce Audy Zarins. 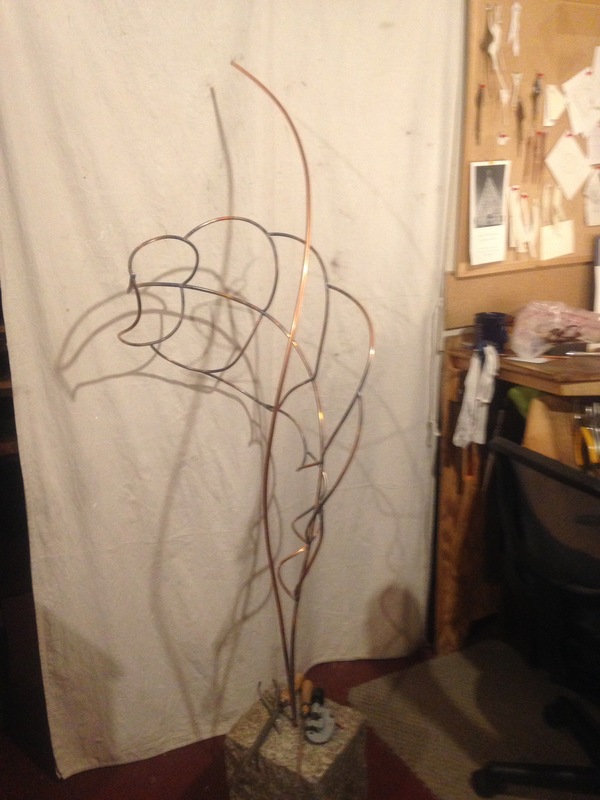 Bring Art into your life- Enjoy wonderful 3 dimensional sculptural work. 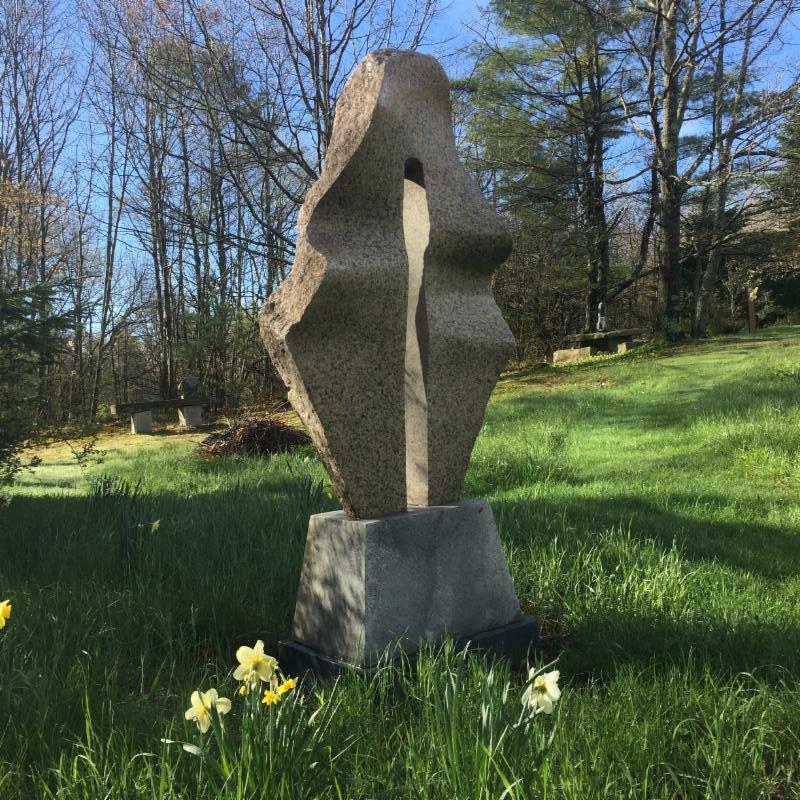 On May 20th you have a chance to visit the beautiful sculpture garden at Hawk Ridge Farm for “Embracing Earth”. A number of my pieces are included in the show. 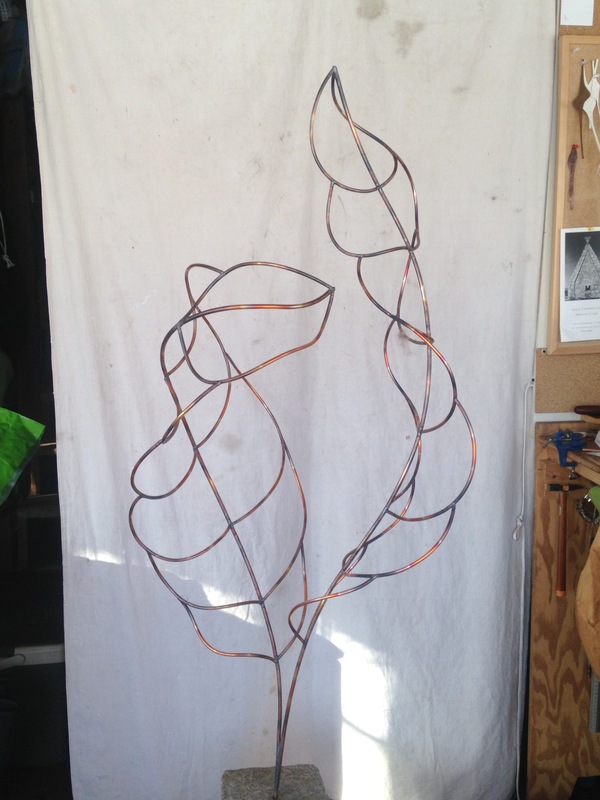 The image below is “Spring Series #1”, a piece that is hammered out of a flat sheet of copper. I look forward to meeting you at the opening. Or you will enjoy a stroll through the wooded sculpture path at any other time you can make it. More information is below. Another sculpture show “Power of Place” will open on June 7th in Wells Reserve at Laudholm Wells. I am still working on a piece that will be included in that show. I can’t wait to finish it and have you be able to see and interact with it. Sculpture by New England artists shown in country home and gardens and along woodland trail. Sunday afternoon open houses from 1pm-4pm. Maple Tree talks listed on website. Open by Appointment. 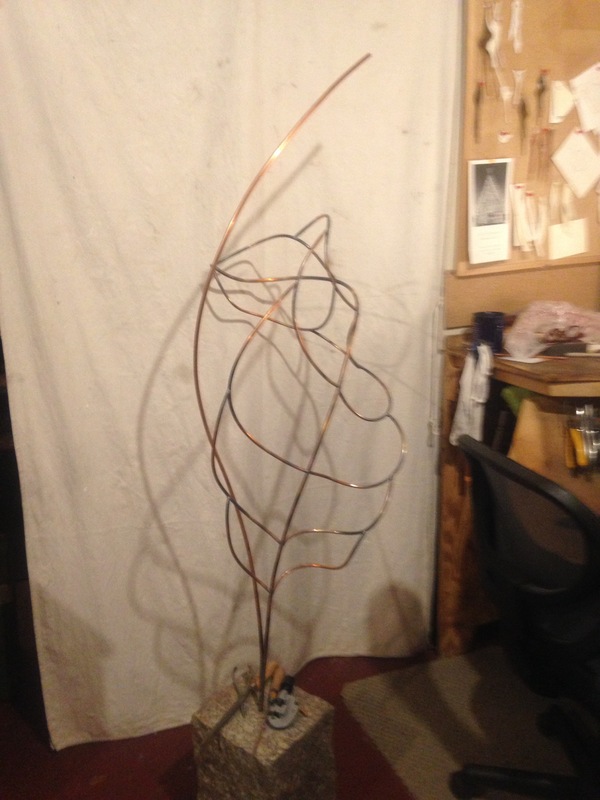 It has been fun finishing this copper sculpture “Phoenix”. 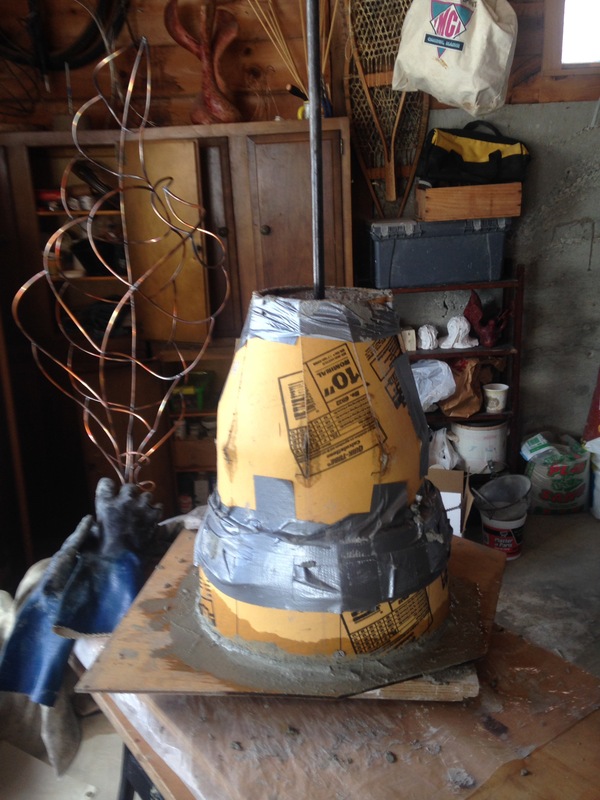 The new exploration for me was to figure out how to let the piece rotate in the base. To achieve this, I carved the base out of cement and inserted tubing and ball bearings. You can find videos on my FB page. 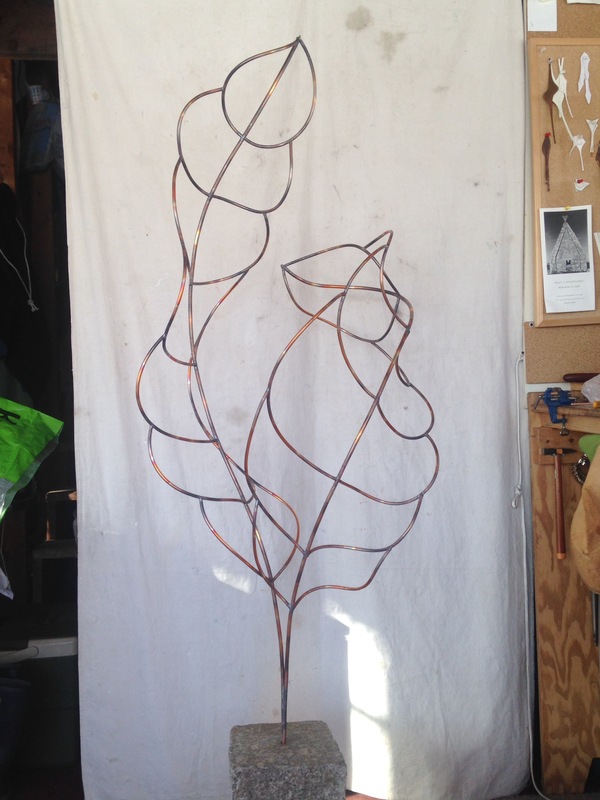 Now I am creating a larger 5.5 foot version in steel. 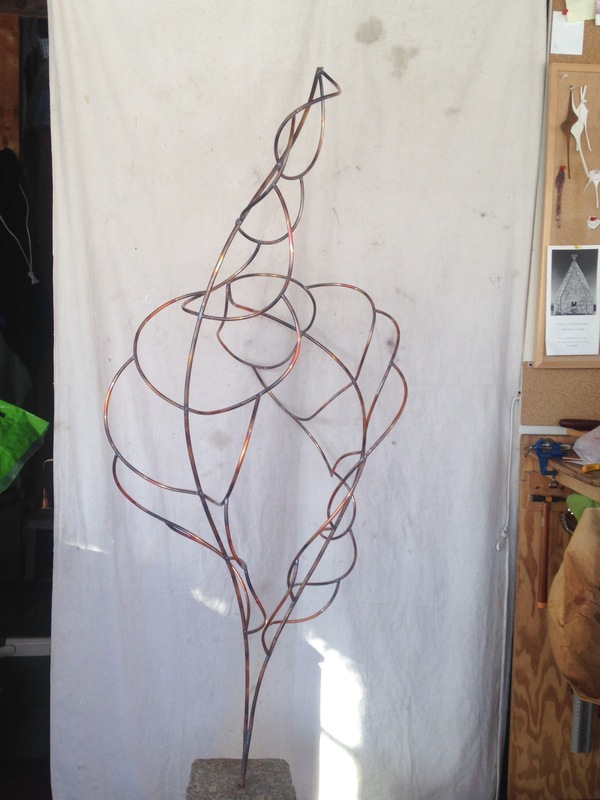 A new sculpture is created: conversation. 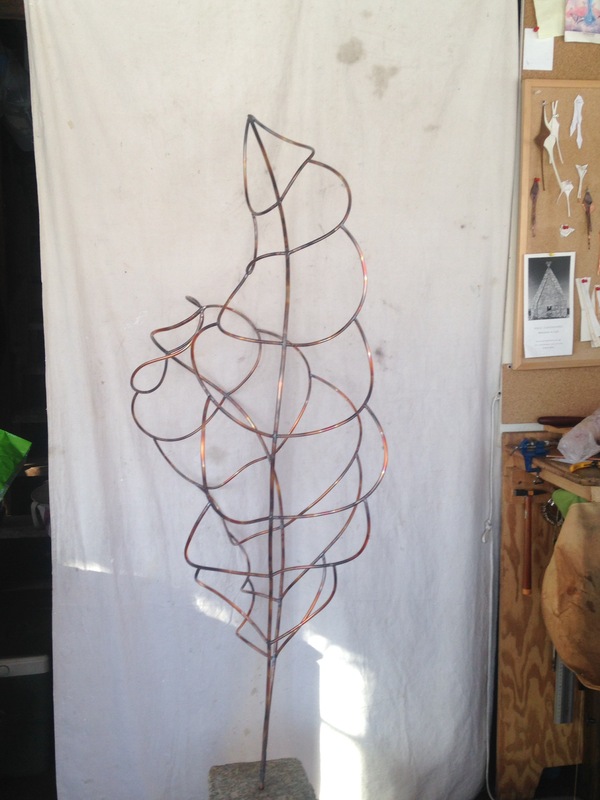 Copper tubing with a carved cement base. It is currently standing in front of Camden Whole Health. Below are a few imaged during the creation process. Some of you might be aware of the sculpture show curated by June LaCombe, Autumn at Hawk Ridge Farm. Here is the link to images of the sculpture show: Autumn at Hawk Ridge. Please browse through them. It is not the same as seeing them first hand in nature. But you will get an idea of the great diversity of sculptural expression. 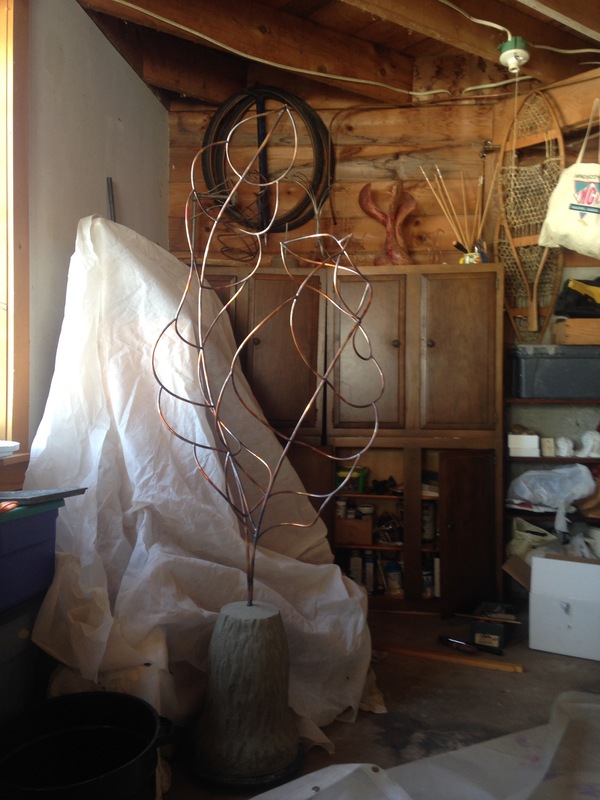 You can see my sculptures in the company of so many great pieces by about 30 Maine artists. My sculptures are images # 13, 28 and 81. Here is a photo I took of “Uprising” on the sculpture path. This is the first time this piece is installed in the woods. I always had it in open spaces. See what you think and let me know. 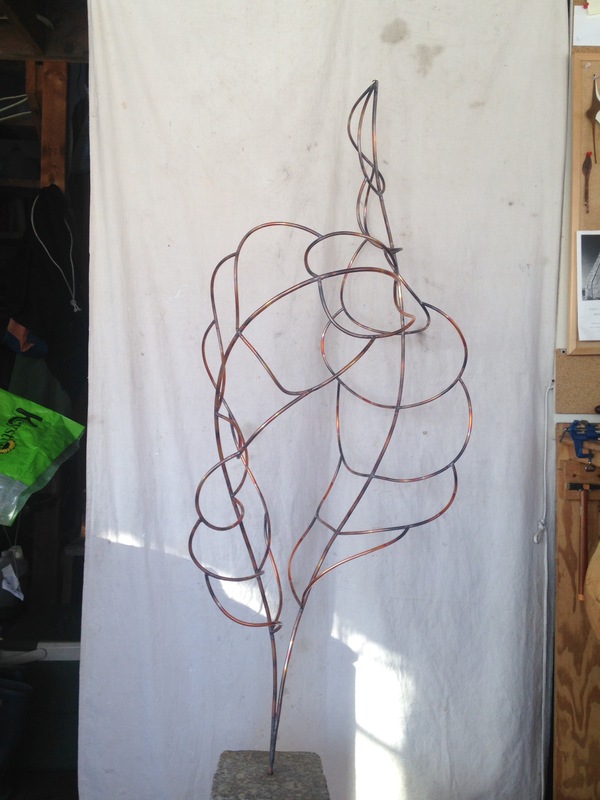 And as a preview, I am inspired to work on different shapes and forms and created the first model in copper. It also can stand as a smaller sculpture by itself. Just in case I want to play in a bigger scale, I might leave my bending tools in a different spot for the winter, so they will not be covered by big snowbanks. Well, it depends on how cold it will get this winter. Enjoy the turn of the season and keep beauty in your life.